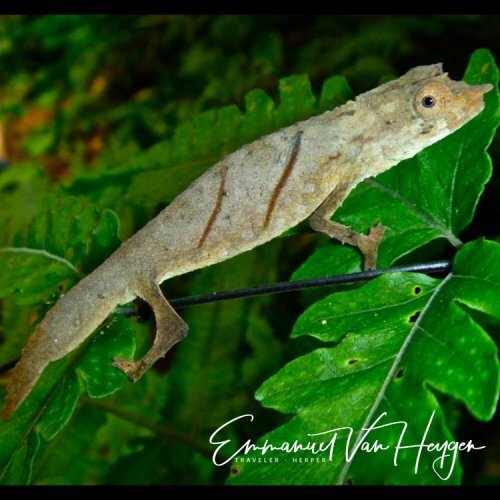 Welcome to another installment of our World Chameleon Species Tour hosted by myself and featuring the breeding expertise of Jurgen Van Overbeke! R. spectrum is a brown colored ground dwelling species whose main defense is its cryptic coloration. This allows it to hide on the forest floor. R. Spectrum used to be exported regularly, but issues with CITES, the governing body of wildlife exportation, shut down exportation for many years. 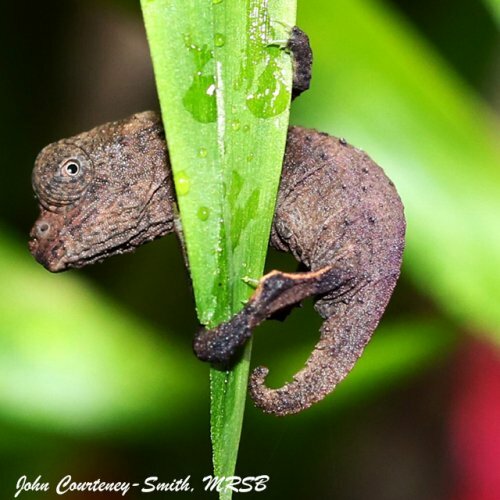 Since then, the pygmy chameleons, including R. spectrum have been raised to CITES II status along with all the other true chameleons. 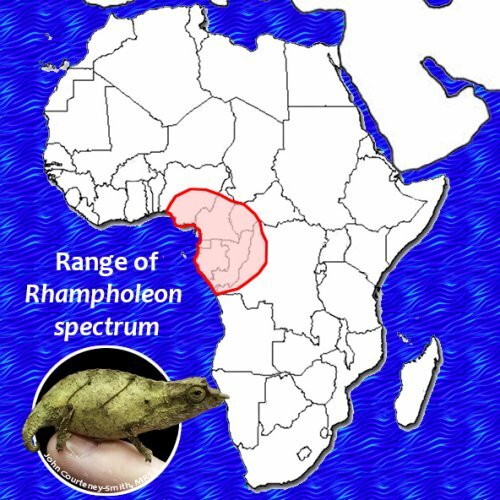 Rhampholeon spectrum is also know by a smattering of common names including the Western Pygmy Chameleon, the Spectral Pygmy Chameleon, or the Cameroon Stumptail Chameleon. Of course, this is why serious chameleon enthusiasts embrace the globally accepted Latin name! Keeping and breeding them is simple and enjoyable, but the husbandry is different enough from the more well-known arboreal chameleons that it provides a rewarding challenge for the chameleon keeper. But be aware that you will need to gain experience with substrate! This is where chameleon keepers often have their first brush with the while new world of bio-active. “Rhampholeon Spectrum is our only available pygmy chameleon from Cameroon, though it has a wide range across central Africa. 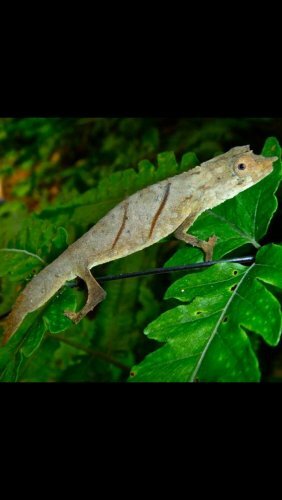 This leaf chameleon is simple to keep, but temperatures are very important. Keep them in standard room temperature with a slight nighttime drop. Remember they are a low land species so they do not want the drops associated with montane species. Ideally, chameleons are kept individually, but the interspecies aggression in R. spectrum is low and, in a sizeable, well planted terrarium, 1.1 to 1.3 have been kept successfully. Feeding is challenging only because of the size of the food items. I have fed my pygmy chameleons baby crickets, aphids, springtails, and fruit flies. They are typical Cameroon species and need their water. I use night fogging and a short misting in the morning and afternoon. When kept at room temperatures they do not bask much and I provide only weak UVB with calcium mineral powder on their food 1 or 2 times a week. 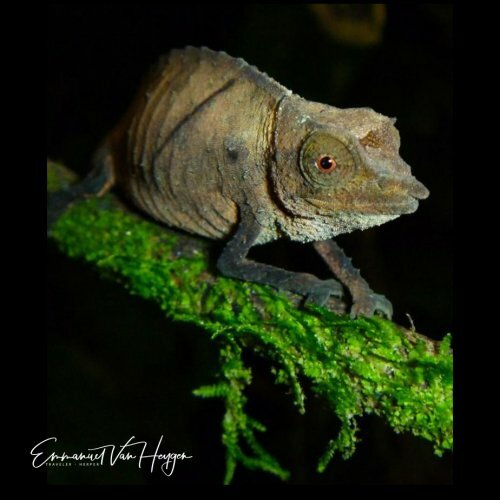 Rhampholeon spectrum is a hardy and enjoyable species which is suitable for chameleon keepers interested in experiencing something different from the standard arboreal “true” chameleons." The images below were taken of a group of Rhampholeon spectrum that lived in a large naturalistic vivarium maintained by John Courteney-Smith, MRSB from Arcadia Reptile. He bred them to F2 and shared how easy it was to care for the chameleons when a naturalistic environment was provided. He did what we all strive to do in chameleon care - create the perfect environment so that the chameleons can take care of themselves!